God’s divine call to “Go ye into all the world and preach the gospel to every creature” (Mark 16:15), underscores our mandate since the genesis of our ecclesiastic journey on January 14, 1990. The enthusiastic flock shepherd by our remarkable pastor, Reverend Devon Dixon and his magnificent wife, Sister Heather Dixon was about to embark on a mission that would pave the way for what followed next. Our vibrant ministry consisted of fourteen (14) anointed Disciples of Christ extremely passionate with an intense desire to serve God, and eager to evangelize the world. With God’s divine direction and guidance we committed our ministry through fervent prayer held at the humble abode of Ms. Doreen Frazier located on Carpenter Avenue. Undoubtedly, God’s hand was writing on the wall our destiny, confirming the assurance of His presence to us. After several intercessory prayer meetings concomitant with our dedication and determination to our Savior, we acquired a house of worship at 1501 Adee Avenue. God honored our deep yearning as we experienced our first dynamic service on Sunday, February 4, 1990 with an attendance of sixty-eight (68) persons set on fire for God. Our membership grew rapidly. Hence it was imperative for us to relocate to a larger worship center. In order to be an agent of healing to our community, we embarked on expanding our evangelism ministry and providing a variety of services for our members, by purchasing our current property situated at 3020 Eastchester Road in April 1998. Since then, our membership has increased significantly to two hundred and for (249) parishioners. We have certainly outgrown our facility and are currently undertaking a major expansion project. We envision a five-year plan to build a new sanctuary that will accommodate a seating capacity of five hundred (500), inclusive of a day Care center, after-school program facilities and a banqueting hall. A governing body involving the Pastor and Board of Elders who also function as the Board of Trustees oversees our church. 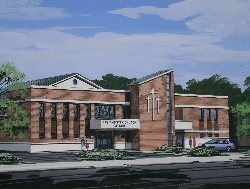 The Eastchester Church is affiliated with the Church of God with the headquarters in Farmingdale, New York and the International headquarters in Cleveland, Tennessee.